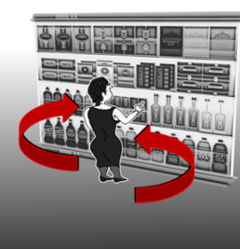 Too far away: shoppers can access the shelves without experiencing any inconvenience. 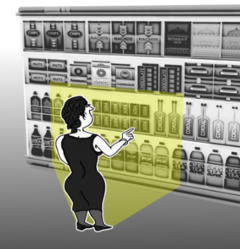 Too close: shoppers can reach around with minimal inconvenience. Just right: visibility is restricted and shoppers are completely blocked. I suppose it is a bit of weird hobby to have, when you look at it, but I'm not the only one. In fact, since I took it up I've learned that there's actually quite a lot of people at it. There's really no shame in it. It's certainly better than what I used to do, which was to stand in the park by the dog mess bins, gazing vacantly into the middle distance and dribbling for six hours at a time. But those days are behind me. 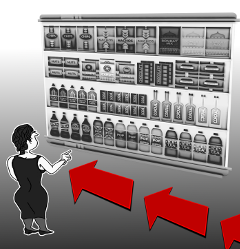 Now I go into the supermarket every day and stand motionless in front of the shelves for six hours at a time. Dribbling. It's really very rewarding, especially when people are trying to do their shopping and I'm stood in the way - which is most of the time. I like lunchtimes best because it gets really busy when people come in from their offices and factories to get their dinners. I stand in front of the sandwiches. Dribbling. Some people though - oh, it's so funny - some people think I'm there to buy something. They wait there patiently, thinking that I'm just taking my time to make a choice. But I'm not. I'm just standing there. Then they gradually get impatient and start tutting. Sometimes they get angry and try to have a bit of a go at me, but not often. Most of the time they wander off, grumbling to themselves, but I just stand there. Right in front of the shelves. Not moving. Staring into space... dribbling. Occasionally - and this is interesting - occasionally people mistake me for a member of staff. Now, that gave me an idea: wouldn't it be great if they actually employed me to stand there, motionless, in a professional capacity? I'd be very good at it; I've put in a lot of practice. So I went and found the manager and put the idea to her, but she just stood there. Motionless. Staring into the middle distance. Dribbling. I think she's going to get back to me.